There’s a bookshelf in my 6-year-old’s bedroom packed with children’s books. Hardcover books. Soft cover books. Books packed vertically and books piled horizontally. Bright new books and faded hand-me-downs. It’s a colourful collection decades in-the-making, even comprising books my husband paged through as a child. The problem is, we’ve read all these books. Finding an unread gem on his bookshelf is like stumbling upon a nugget of gold. It’s an exciting rarity. So, when we first paged through The BIG Book of Animal Stories - a chunky collection of new bedtime tales - my little one and I got excited. And as fans of all things fluffy and cuddly, we were super-elated at the idea of a book dedicated JUST to animal stories. With eight stories in one book, we had just over a week’s worth of bedtime stories. GOLD! On the first night, we agreed to start with the first title to catch our attention: The Perfect Job for an Elephant. It was a smile-maker of a story about a little elephant looking for a job that’s perfect for her. Nothing quite works out until she finds one that’s just right. Convinced we’d already read the best story, I didn’t expect to enjoy the following evening’s story as much. I was wrong. The Special Guest was another chuckle-inducing tale. With every new story, I was wowed again and again, repeatedly and unexpectedly, until we’d devoured every story, each one as heart-warming and easy-to-adore as the next. Out of all of them, our favourite was the fun and upbeat Fins, Fluff and Other Stuff, a rhyming story that reminds us that we’re perfect just the way we are – a lovely lesson for the littlies. 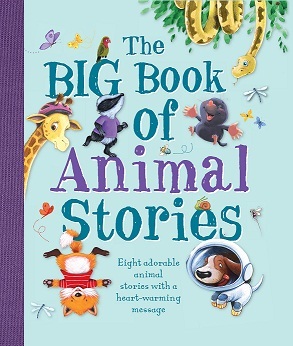 The BIG Book of Animal Stories is made up of eight stories, all featuring a number of characters who will tug on your heartstrings – each brought to life by a variety of authors and illustrators. The Next Steps section at the end of the book offers wonderful and engaging suggestions of how to enjoy the stories once they’ve been read. These include guessing games, quizzes and discussion ideas. Colourful, easy-to-read and a joy for both reader and listener, The BIG Book of Animal Stories is a must-have for any kid’s bookshelf. Titles in this book include The Special Guest; Monty the Hero; Space Walkies; The Perfect Job for an Elephant; Little Hedgehog’s Big Day; The Nearsighted Giraffe; Fins, Fluff and Other Stuff and Be Careful, Barney.